Sorry, again another food history book! I think I really need to take a hiatus on this genre as you can only take so many food books. 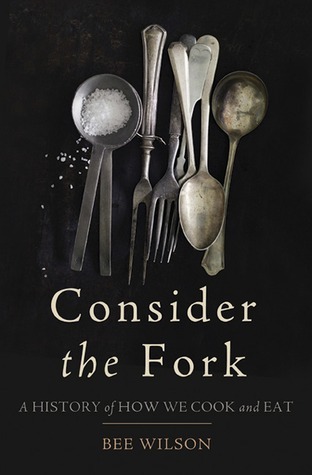 Consider the Fork: A History of How We Cook and Eat tackles food history from a different standpoint from my previous foodies reads, Cooked and A History of the World in 6 Glasses. Instead of contemplating history through the lens of particular cooking and drinking styles, Consider the Fork posits the effect of how food and culture and irreversibly intertwined and that affect on the technology of how we eat. Whether it be the documentation of how the shape of spoons followed the rise and fall of British monarchy or how chopstick culture is so vastly different from fork culture, this book is interesting, but also kinda dull. One can only find examinations about how refrigeration got started and why a butter knife is so useless interesting for so long. This book probably needs to be about 300 pages shorter - not a good sign. To be perfectly honest, I think this book would be better served as an hour long TV special as visuals are pretty integral to understanding the evolution of food implements and seeing how kitchen design reflects the society of its time. Hopefully someone at the Food Network reads this and takes heed as I think that channel could really use less Guy Fieri and more food culture. If you've read this book, what did you think of it?